True Blue. 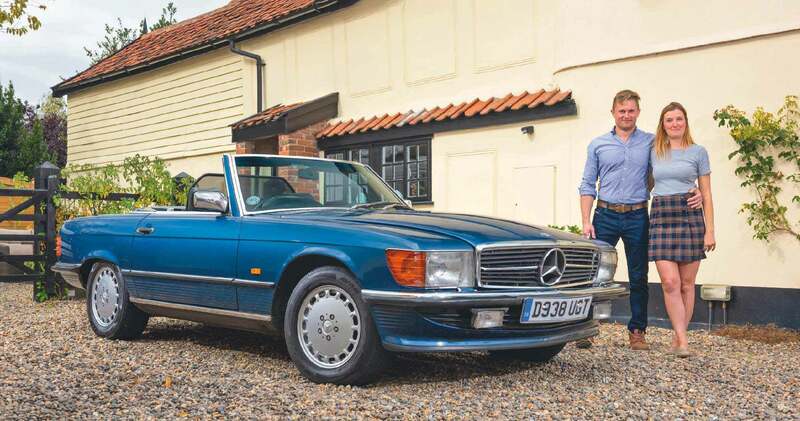 Proving the R107’s qualities as the perfect cabriolet for road trips, this 1987 Mercedes-Benz 500 SL R107 recently ferried its owners around France. Words Dan Furr. Photography Dan Sherwood. Despite the colourful variety of hot hatches and sporty saloons car manufacturers have laid before us over the years, one body style exudes glamour like no other: the cabriolet. It’s a simple idea which has remained popular throughout automotive history, and it doesn’t take much to bring to mind images of the rich and famous cruising in exotic drop-tops while the vast majority of us pootle around in comparatively drab machinery. Meh! It’s safe to assume a classic Mercedes is what many will visualise when asked to picture a roofless sports car. Moreover, if you’re after a comfortable continent cruiser promising high-speed thrills and reliability, an R107 is likely to be your weapon of choice. 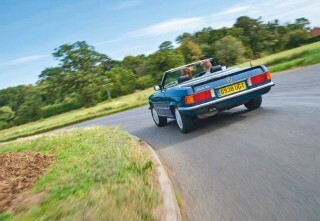 And if you’re ‘in for a pound’, then you might as well jump behind the wheel of the V8-powered 500 SL R107. The blue belter he’s in possession of was the fourth and final of its kind to be subjected to his beady eye. “At one point, I entertained the idea of buying a Triumph TR6, but the 500 SL I bought combines serious firepower and classic looks with modern levels of reliability and comfort. Fuel injection and bags of luggage space, plus the availability of rear seats, meant the car ticked every box when I sat down to draw up a list of my requirements from a sports car. 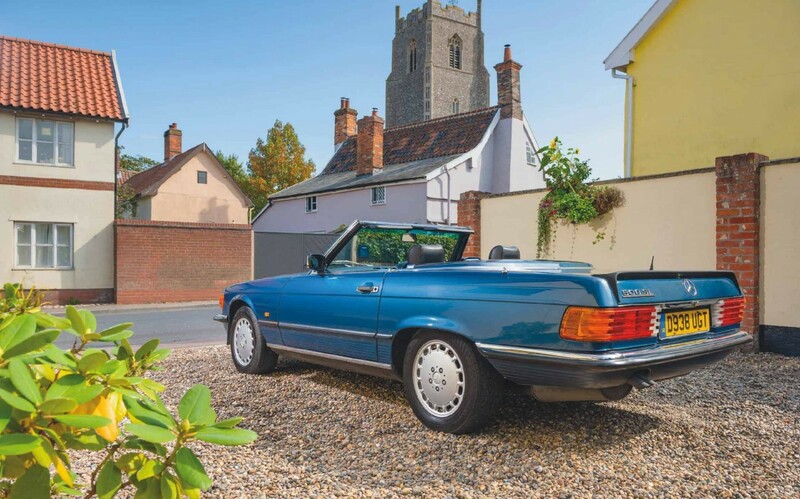 Four owners prior to Olly have taken exceptionally good care of the eight-cylinder stunner. His name appeared on the car’s logbook in early 2017. 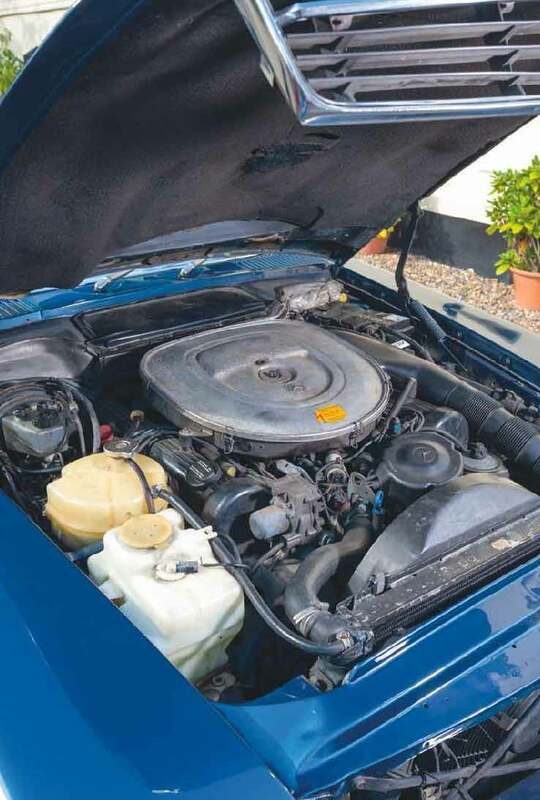 “I had a few niggles to contend with, including a sticky boot release mechanism, but the car sailed through its MOT, affording me the opportunity to hit the road safe in the knowledge I’d bought a good ‘un!” With 170k miles covered, it’s clear to see he isn’t the only petrolhead to have enjoyed plenty of seat time in the ’1987-plater. Indeed, Olly tells us one of the car’s previous custodians racked up a high number of miles using the car as a daily driver for more than five years, yet the bulletproof nature of the five-litre lump up front, not to mention meticulously observed service and maintenance intervals, means this fantastic 500 SL performs just as well today as it ever did. Driving al fresco on sunny days is one thing, but most owners of open-topped sports cars dream of enjoying long road trips in their chariot of choice. In truth, few ever get around to setting sail for foreign lands. Enter Olly’s significant other, Lucy Dawson. 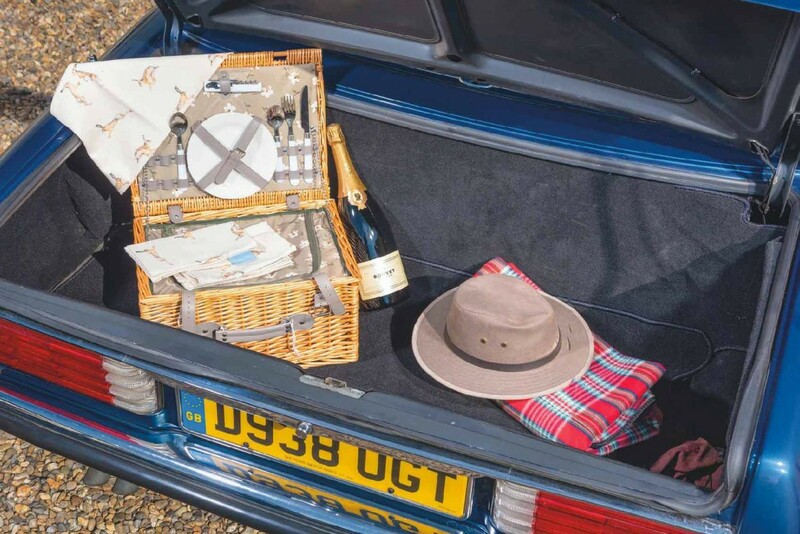 “We were discussing where to go for our next holiday when I suggested a road trip in the Merc,” says the Suffolk-based artist and textile designer (bellaart.co.uk). This was music to Olly’s ears, and it wasn’t long before the pair were planning a route which would enable them to zig-zag their way through the vineyards of southern France. The R107’s reputation for safe, reliable motoring through quality engineering was clearly proving itself as the car continued in the direction of Normandy. Just as Olly and Lucy were preparing for the final leg of the journey in France before boarding a homebound ferry, however, disaster struck. “We had less than fifty miles of the trip remaining when the car started to lose power uphill,” sighs Olly. “Half a mile later, it conked out completely.” A roadside investigation revealed a dead battery and a suspected failed alternator. Drat! Labour costs were covered by the RAC. Thankfully, due to the lack of new parts required, there was no charge to be met by the delayed holidaymakers. Well, unless you count the cost of the impromptu coffees and croissants they gobbled down in a local café while they waited for their Merc to be mended! Since its launch in 1971, the R107’s timeless beauty and range of bombproof six and eight-cylinder engines has made the model a popular choice with those looking to enjoy modern levels of refinement and reliability wrapped in a classic open-topped styling package. 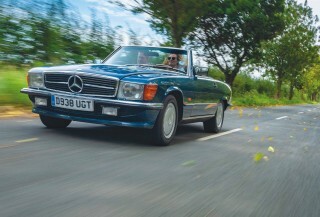 In fact, such was the universal appreciation for the R107 during its near two-decade production run, it was the only cabriolet offered by Mercedes! Today, enthusiasm for this modern classic is on the rise, with tidy examples – like the 500 SL presented here – commanding strong money in the showrooms of specialist dealers and on the floor of auction rooms. Our advice is for you to grab an R107 while prices remain reasonable. As Olly and Lucy can attest, for summer fun and sheer class, there are few drop-tops which can offer the same high number of smiles to the mile! Worst thing about your 500 SL It broke down in France! Best thing about Mercedes ownership Feeling fly! Bella Art (bellaart.co.uk) was founded by Lucy at her Suffolk studio eight years ago. Specialising in the creation of luxury home accessories featuring designs taken from her original watercolours, her work is heavily influenced by the woodland animals and other wildlife spotted in and around the village she lives in. Proud hares, wild horses, beautiful bees and birds decorate her high-quality cushions, kitchenware, fabrics, lampshades, make-up and wash bags, prints and greetings cards, all proudly made in the UK. Bella Art's product range is constantly expanding, with Lucy's latest designs set to adorn a new line of quality chinaware. Left Punchy five-litre V8 cruises without complaint, producing close to 240bhp and 296lb/ft torque in stock trim. Above Metallic blue paintwork takes years off the R107 Left There's every chance Olly and Lucy misheard what was being said to them when they were told what they'd need to carry onboard in order to drive legally in mainland Europe! 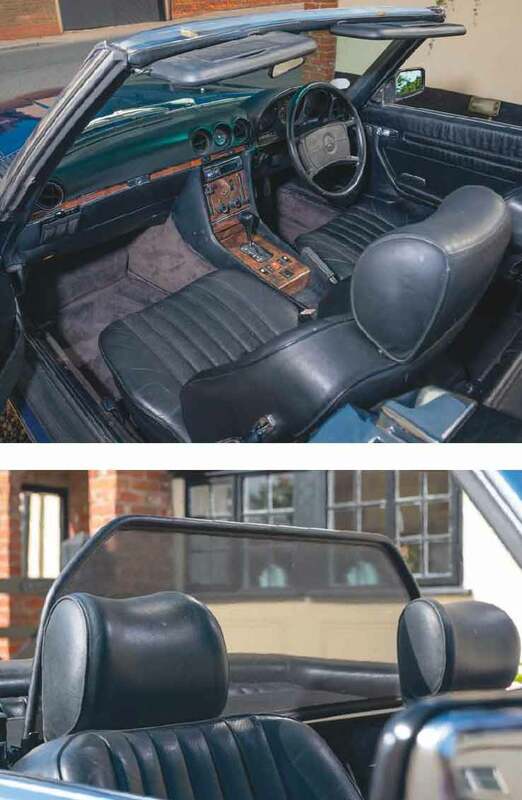 Bottom left Leather has been sat in for more than 170k miles, but remains in fantastic condition thanks to hide balm.